Scientific research has shown that positive and feelings are transferred to the people you are around when you experience these feelings. Therefore, one way of making a new acquaintance like you is to make him or her feel positive and happy. 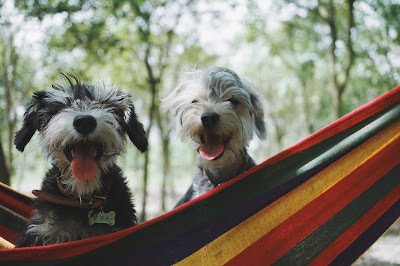 Dogs have a calming and relaxing effect on people, and they are a powerful association with happiness, at least for dog lovers. 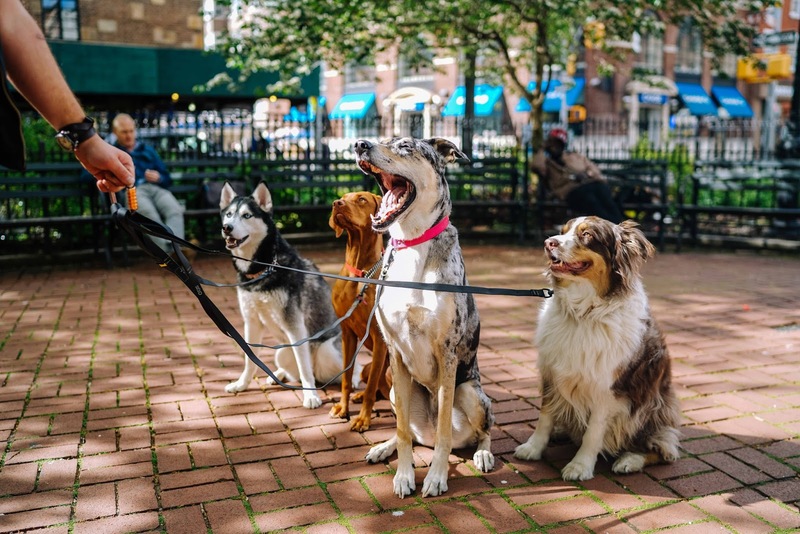 They are often friendly with strangers and won't hesitate to greet and wag their tails at a friendly and approachable face. It's hard to be unhappy when confronted with such cute and happy faces. Therefore, if you love dogs and are looking for love, get a sweet, cute puppy or friendly dog and take him or her for a walk where other dog lovers congregate. All the happy and cute feelings your dog elicits will be transferred by association to you! Just make sure not to get into a dog fight, because that would have the opposite effect. 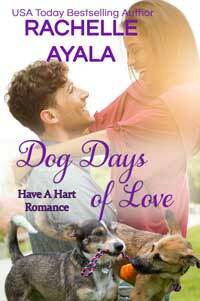 In my newest book Dog Days of Love (available for a special pre-order price of 99c), Dale Hart tries to engage a pretty young woman's dogs by tossing a Frisbee at them. Read an excerpt and tell me if Dale Hart made a good first impression. Vanessa Ransom couldn’t afford to sweat. Not while stumbling after her two dogs through Golden Gate Park wearing a stiff business suit and a pair of power pumps. The hot summer sun blazed overhead, and waves of heat simmered over the sweltering city streets—an unusually hot day for the city by the bay, better known as San Francisco. Her two darling mutts, Randi and Ronni, circled around her legs, looking for that perfect place to potty. They sniffed every bush and fence post, tails wagging and tongues lolling, but they wouldn’t settle down and do their business. Vanessa, or Nessa as she was known to her friends, checked the time on her phone. She had a job interview clear across the city and she was running late. Randi, the bristly black and white rat terrier sheltie mix, pulled on her leash, lunging at a little boy bouncing a ball. She was the alpha dog, full of energy and stuck her nose into everything. Meanwhile, Ronni, the shepherd terrier mix with soft brown hair, laid down on the grass and put her head down. While Ronni took life easy, she was also affectionate and loved to cuddle. If only her dogs would hurry up. Being late to a job interview was not an option since her summer internship was ending soon and she didn’t have a job lined up. “Woof, woof,” Randi barked and lunged at a floating Frisbee as if it were an affront to her that she wasn’t invited to play. Snap. While Randi complained, Ronni leaped and snagged the Frisbee. A man jogged up with his hand outstretched. “Good dog.” He patted Ronni, and she dropped the Frisbee at his feet. Randi barked and forced her way between them, hopping up on her hind legs for the Frisbee or the pat. She always demanded to be fed first, patted first, and given her choice of playtime activities. She was high-energy, after all. “Mind if I play with them?” the man asked. His light-brown eyes twinkled as he took Nessa in, from her perfectly pressed hair to her starched blouse, understated silver jewelry, gray suit and skirt, and black leather pumps. Nessa’s heart took an extra pump. He was a young, twenty-something, tall, handsome, and white. “Best of luck, then,” the man said. He threw his Frisbee, and it soared high in the air currents across the lawn. Nessa couldn’t help her gaze from following its arc. It floated free and easy, like the man with his tousled curls and lazy grin. He waved at her before stretching out his long legs and chased after the Frisbee. What kind of weirdo played Frisbee by himself while hoping to pick up other people’s dogs? Randi barked and pulled against her leash, while Ronni gave Nessa an imploring look. Both dogs stared longingly at the man and his Frisbee, and Nessa couldn’t help checking out the guy’s physique. Tall, but not lanky, the man was well built but not bulky. He wore board shorts, a Warriors jersey, and sneakers without socks, and he was most likely unemployed. Love the excerpt, Rachelle. I love dogs, so this book will definitely be a charming read. Thanks for sharing. I love the pups on the cover. Sounds like a great read. Thanks for sharing. I love the concept of dogs bringing their owners together. Well done, Rachelle. Congrats on the release! Dogs bring a smile to your face, so it's not surprising that they do bring people together. Thank you. so do i!